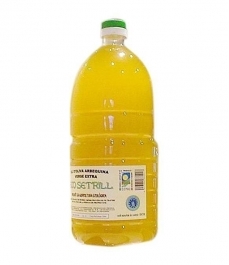 Ice Oil Eco Setrill - Glass bottle 3 l.
> Ice Oil Eco Setrill - Glass bottle 3 l.
The olive oil of ice is the oil obtained from the olives harvested at a very special moment of the harvest, when the olives were frozen at their optimum maturity and are still in the tree. This very special thing happens rarely, not much less in all the campaigns, and when that happens, the oil obtained is kept in separate tanks. 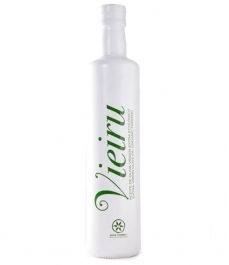 Like the Eco Setrill oil, it is an unfiltered olive oil, cold pressed and ground with a stone mill. Authentic crafts for a ripe fruity oil with all its natural properties. 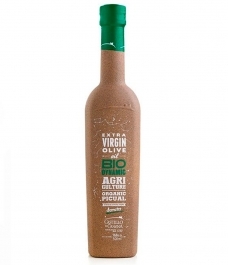 This virgin olive oil is a monovarietal of the Arbequina variety. Pure juice of high density and very low acidity, excellent palate, very sweet and soft, highly nutritious and unlike other oils does not alter the flavors of food and does not repeat in the mouth. You can drink perfectly. 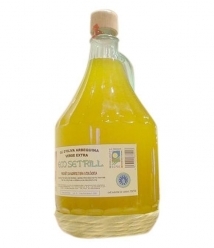 ECO SETRILL is an olive juice "Arbequina" of very high quality. It is the fruit of a few lands in the mountains of the Tallat mountain range and in the middle of two spas (Rocallaura and Vallfogona), a geographical area that offers a wide range of privileges in terms of sun and sea. climate. The trees are 100 years old, passed down from generation to generation and grown in the same way as our ancestors, like 100 years ago. The culture on the ground is in dry land. No chemical substance or anything that can alter nature is used. The diet of the plant is essentially the richness of the soil and the rainwater which conditions its production, although supplemented by a minimum of organic composting. Part of the soil is maintained with living plant cover (native or planted) for 5 or 6 months each year, depending on weather conditions. Pests are controlled by cultural practices (manual or mechanical). The entire process is carried out in an ecological way and currently has the certificate of the existing control body in Catalonia and the EEC control system. All this translates into a very different oil concept, nothing to do with how we are used today. So, it is dedicated to everyone, but especially to gourmets who want to recover the origins and old traditions of our home and people with chemical sensitivity (or SQM). The fruit harvesting process is manual, according to the old branch branching system, respecting the tree and its environment. It is transported gently in breathable boxes to the mill, where it is cleaned and then ground in a stone mill to give the first true cold pressing. Then it goes through a slow process of natural decantation that separates the thickest remains of the fruit and the oil from the vegetable water. After a rest period, it is packed, also manually, in different formats. Depending on the timing of the bottling, you may find small rests of natural sedimentation in the bottle.